Why Spanish Immersion with Expanish? One of the most wonderful things about learning a new language is realizing that the conversations which used to be hard to follow are now simple, and plot twists in telenovelas now shock when they once meant little with no subtitles. One of the best ways to truly enter this world is through a Spanish Immersion program, which offers you a doorway not only to advance your Spanish but a deeper understanding of the Spanish Speaking world. The best way to experience a Spanish Immersion Program is to go to a Spanish speaking country. A wonderful place for your Spanish Immersion experience is the cultural capital of Catalonia: Barcelona. While enrolled in Spanish courses, our Spanish immersion program offers you the chance to sleep, eat and live like a local! We offer a variety of housing arrangements which allow you to sleep like a local: from homestays to solo apartments, your living arrangements offer the opportunity to experience a genuine Spanish living! Spice up your stay by eating like a local: our local professors know the best restaurants and recipes to assure that you leave Barcelona with your way around the Spanish table. Live like a local by experiencing all the pastimes and pleasures Barcelona has to offer with our organized excursions such as bar crawls, flamenco classes, and city tours. 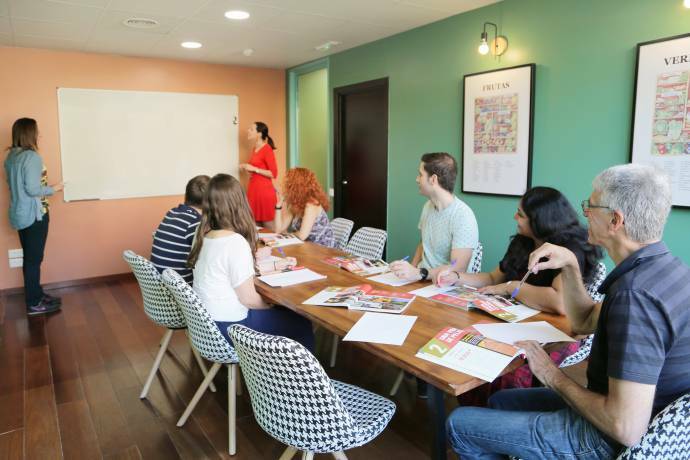 In addition to offering a Spanish Immersion Experience, Expanish language school in Barcelona offers the opportunity to learn Spanish in the way that best suits your needs and goals. Are you looking for intensive language courses? We offer courses between 20 and 30 hours a week, allowing you to delve into the language all week long. If you need a little more one on one practice time, our private lessons might be just for you. If you are busy during the day, working or exploring, we offer night classes to make sure your learning fits your schedule. Depending on what you would like to learn, we offer the ability to study for the SIELE or DELE Exams, Spanish for teachers, and we even offer classes outside the classroom! For those of us who sometimes have a hard time sitting still in a classroom for long periods, Expanish offers a variety of experiential learning opportunities. 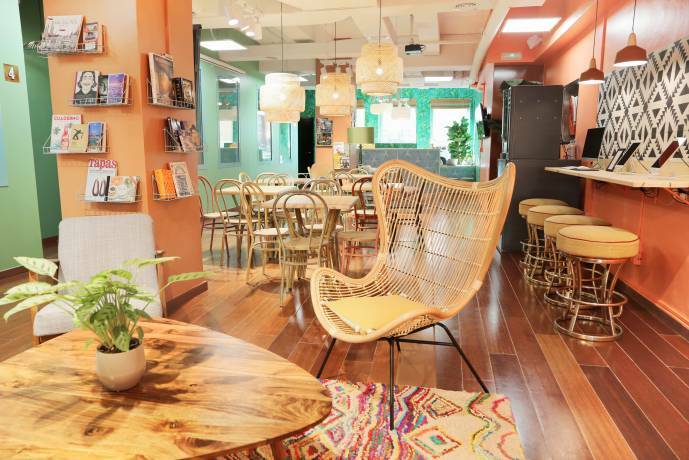 From internships to flamenco lessons in Spanish, these courses allow you to explore and expand not only your Spanish language skills but also expand the variety of material you learn. We also offer a completely unique Spanish in the City program, which allows you to learn Spanish as you explore beautiful Barcelona! What is better to spice up your immersion experience than cultural activities? Barcelona is full of opportunities to experience Spanish culture, from visits to the intriguing Casa Vicens to the beautiful Apolo nightclub located in an old theatre, or tango classes and shows. An immersion experience with Expanish allows you to texture your life as you choose! While a trip on a city tour bus to sightsee offers a few good picture opportunities, Expanish Spanish in the City course is sure to gain you more than just a few likes. In this course, you will visit iconic spots within Barcelona, as well as learn some local secrets and perspectives on classically tourist spots. If you are looking for more internal exploration than external, a flamenco course paired with your Spanish lessons might be just what you are looking for. Flamenco, the typical dance of the Andalusia region, offers the opportunity to explore the movements of your body. If you are looking for the best places to cool off with a refreshing beverage or two, a bar crawl through Barcelona might be right! A true immersion experience will offer you the ability to add texture to your experience as you see fit. Barcelona is a beautiful city, and studying with Expanish offers the opportunity to explore and enjoy! Fill in this form to get more information about the courses and application to Expanish Barcelona. You can also ask questions to the school here.